Allevyn Gentle Hydrocellular Foam Dressing uses triple action technology to absorb, retain and transpire exudate to provide optimal fluid management. It provides an optimal moist wound environment for the promotion of faster healing and the gentle adhesive comes off lightly allowing for less painful dressing changes. The gel adhesive in Allyven Gentle holds the dressing in place during the application of secondary retention for convenient "3rd-hand" application. Features include advanced triple-layered construction, absorbent hydrocellular pad, perforated soft gel adhesive wound contact layer, and highly permeable waterproof outer film. Cleanse the wound in accordance with normal procedures. Select the appropriate dressing size. Prepare and clean the skin surrounding the wound area by removing excess moisture. Any excess hair should be clipped to ensure close approximation to the sound. Using aseptic technique remove the protector material from Allevyn Gentle and apply the adherent side to the wound ensuring good contact all the way around and secure with a dressing retention sheet e.g. Opsite Flexitape, tape, or bandage. 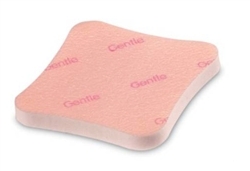 During the early stages of wound management Allevyn Gentle dressings should be inspected frequently. Where the product is used on infected wounds the infection should be inspected and treated as per local clinical protocol. Dressings can be left in place undisturbed for up to 7 days or until exudate is visible and approaches to within 5/8" of the edge of the dressing, whichever is sooner. -Do not use Allevyn Gentle Dressing with oxidizing agents such as hypochlorite solutions (e.g. EUSOL) or hydrogen peroxide, as these can break down the absorbent polyurethane component of the dressing. -When used under compression Allevyn Gentle could become dislodged i the limb experiences a rapid reduction in edema. -If reddening or sensitization occur discontinue use.